The Ptidej UI Viewer Standalone Swing project provides the class ptidej.viewer.ProjectViewer, which is currently the most usable graphical interface to the Ptidej Tool Suite. The current implementation of the Ptidej UI Viewer Standaline Swing is actually a mini-framework. It makes it easy for third-parties to integrate their own extensions and visualisations. It provides currently three types of visualisation: one purely graphical, one showing a hierarchical tree and a graphical representation, and one showing two hierarchical trees and graphical representations to distinguish types and their implementation classes. The class DesktopPane is the world in which various visualisations can live. These visualisations are typically displayed as internal Windows. 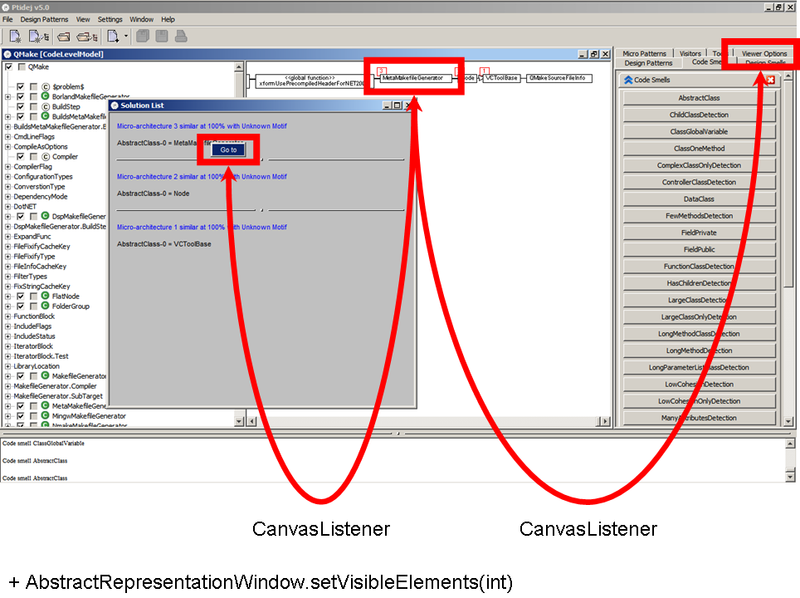 Extensions and other lists listens to the visualisations by implementing the CanvasListener interface. The canvas also listens to the DesktopPane to receive notification of changes, for example in the choice of graphical elements to display. Hence, interactions can go in three directions without strong coupling (from the DesktopPane to its Windows, from the Windows to the lists, and from the lists to the Windows.